Home bowling alleys and bowlercade games offer cheap fun for the whole family. You can find dozens of styles from smaller arcade games to inflatable bowling pins and even traditional bowling sets made of plastic and wood. And with so many bowling games to pick from it can be tough making a choice. I’ll showcase a variety of bowling games comparing the pros and cons of each one. Whether you’re looking for a tabletop game or a bowlercade for your kids there’s something here for everybody. Every bowling game is a little different ranging from simple blow-up bowling pins to more detailed electronic games. There is no right choice but they all have their pros and cons. Think about what type of game you want and how much space you have. Do you have 4-5 feet of floor space for a mini bowling arcade game? 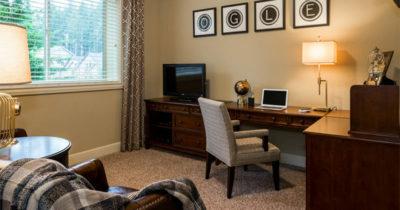 Or is your house better suited for a tabletop game? I find that most young kids prefer the ground-based games but they can grow out of them quickly. And these eletric bowlercade games do require batteries so you’ll need to get them setup before they’re ready for play. On the other hand you can find backyard bowling games that offer a carnival feeling in your backyard. Indoors and outdoors you have lots of options to browse through. None of these games are the “best” since they all offer a different experience. I recommend skimming this entire guide to see what’s out there. You may be surprised how many home bowling games are on the market! And with new games added frequently you’ll have a sea of bowling-based entertainment to pick from. The Sportcraft Bowl-A-Rama bowlercade game is fun for the entire family. It’s a small bowling alley arcade game with a 4 foot long track for bowling. On the side you’ll find a small plastic ball return that automatically brings the ball back after each throw. The pins auto-reset and the game detects rounds for each throw. This makes it easy to keep track of scoring and keep the gaming moving without much maintenance. 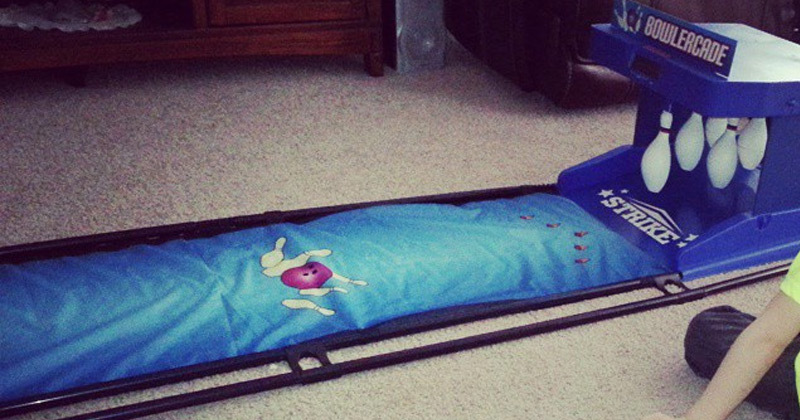 It’s the perfect game for kids ages 2-10 and it’ll fit pretty much anywhere. 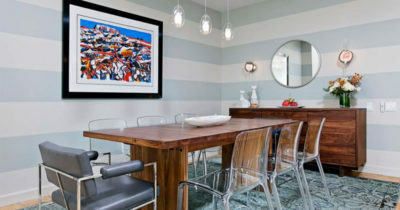 If you have a long kitchen table it can work there, but it’s mostly made as a floor game. The ball is made of plastic along with the pins so it’s very light. It should not cause any damage to your floor and it shouldn’t be too heavy for your kids to throw either. You’ll need four D batteries to get this working and the batteries should last for months. However there is a big downside here. The plastic in the game is pretty cheap, so this game may need to be placed against a wall or reinforced with something to keep it stable. When the ball returns it can teeter out and may fall off the rails. Plus the bowling lane uses a very thin plastic fabric so it can bunch up over time. The best solution is to weigh it down with something on one end, which again can make the game feel cheap. The electronic features work perfectly and you should have no trouble getting some fun outta this game. But just know it will take time setting up and may need to be reinforced to keep it working without any hiccups. You could also remove the return area & the fabric to just use the bowlercade system. This way you won’t have any of the cheap pieces but still have the ball & the pins that work well together. Another similar electronic bowling game is the Majik Roll-A-Strike bowlercade featuring digital pins and a scorecard. This game brings all the fun of a bowling alley home without the pin cleanup or the heavy weighted ball. This measures about 72″ long(6 feet) and only takes up about 18″ across(about 1.5 feet wide). It’s unlikely you’ll have a table that fits a full 6 feet so this game is really made for the floor. All pins in the back are fully electronic and placed flat against a digital screen. They light up in the dark so you can play this game day or night, living room or basement or bedroom. Right above the digital pin setup is a score counter that tallies the score including realistic counts like a full 10-pin bowling alley. It supports up to 4 players and it counts scores like a real 10-pin alley with a perfect game score of 300. The final score is shown on the digital display and it even comes with speakers to replicate bowling alley sound FX. All along the side you’ll find a small padded bumper to keep the ball inside the lane. This really helps with younger kids who are still developing their motor skills. And the alleyway is made of a sturdy cardboard-type material which should hold up well under the weight of the ball. Really fun game if you have the space and it’ll keep your kids busy for hours. The folks behind this Stats Bowlercade game really put in some effort to make a quality toy. It’s far from perfect but it can withstand the weight of the ball and it doesn’t feel very cheap. In total the game measures about 5 feet long so it can work on a table or on the floor. The bowling pin reset box measures about 2 feet tall which isn’t too bad for kids or young teens. The plastic ball return rail does seem a bit flimsy but it holds the balls well. It’s sturdy enough to act as a ball return and the bowling ball itself is pretty light so it shouldn’t pose a problem. Each pin is connected to the top of the blue box so they get knocked “up” into the box rather than knocked down. This allows the machine to reset the pins automatically. Plus the ball can loop back into the ball return without obstruction. The game is fairly realistic game and it does bring the experience of bowling right to your home. But since it only stands about 2 feet tall this really isn’t a game for adults. Unfortunately the ramp is also made of a thin plastic-type sheet which can scrunch up while playing. If you keep some weight on one end this’ll solve the problem. Overall the Stats Bowlercade game is really fun. The electronic score card and the pin resetter work flawlessly and offer a fun bowling experience at home. But it’s still a fairly cheap toy and some of the materials will feel cheaper than you expect. Moving away from the digital arcade games you might prefer a plastic bowling set instead. 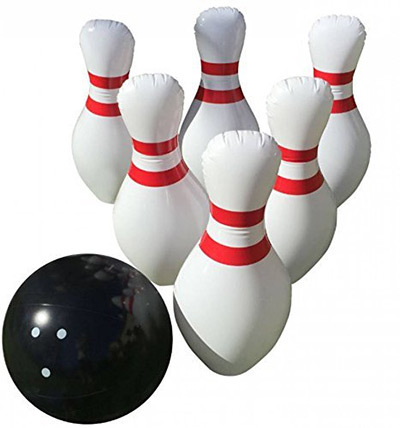 CusCus has a wonderful 12-piece bowling set that comes with fairly large pins about 8″ high. Along with these 12 pins you also get 2 plastic bowling balls that measure about a 4″ diameter. This game is great for both kids and adults because it feels so lightweight and realistic. The balls can feel surprisingly light which may be a problem if your kids aren’t old enough to get a good throw. You could replace the bowling balls with something larger like a soccer ball, but I think the 2 plastic balls you get should be sturdy enough to knock down the pins. Because this isn’t a digital set it will require manual setup. Kids may need to take turns as the pinsetter or have an adult there to reset the pins. But without all the plastic lanes and plastic scorekeeping equipment this is also super lightweight and made for practically anyone. These materials are extremely durable so it’s unlikely they’ll crack or break open. 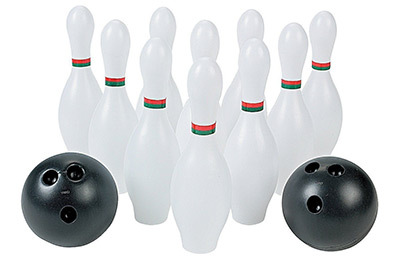 If you’re looking for a simple plastic bowling set for home then this pack by CusCus is an excellent choice. If you have really young kids ages 1-4 then you’ll probably want a bowling game that they can handle. The Etna inflatable bowling set is supersized and super fun. Each pin needs to be blown up but it doesn’t take too long. And once they’re all inflated you can keep them stored away for a play date or some afternoon leisure time. 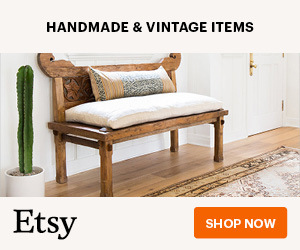 These pins are big and they measure about 28″ tall(over 2 feet). The black inflatable bowling ball is also pretty large measuring about 1 foot in diameter. The beauty of this bowling set is that it’s incredibly safe. The large blow-up plastic/PVC material is soft and spongy so it won’t damage anything in your home, and more importantly won’t damage your child! Each pin has a weighted piece of cardboard at the very bottom to keep a sturdy base while standing. This set works well inside or outside and there’s no limit to how many games you can play. 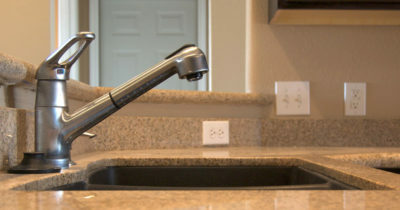 One thing you should be careful of is bowling on any sharp or rigid surface. The material is strong but this bowling set is still basically a series of inflated balloons. They can pop if you’re not careful so try to set up the bowling area on a flat surface. For this exact reason I’d avoid playing outside. Can it work in the lawn? Totally. Although you do risk popping some of the pins or the bowling ball. But for a light indoor set this can be really fun for young kids. 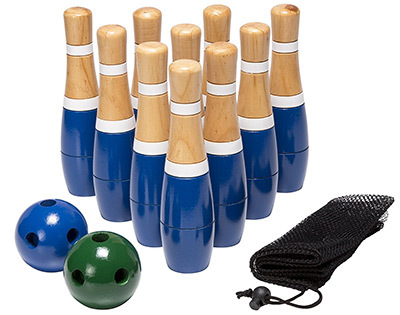 If you like the idea of an all-wood bowling tournament at home then this wooden lawn bowling set is perfect. It’s created by Hey! Play! 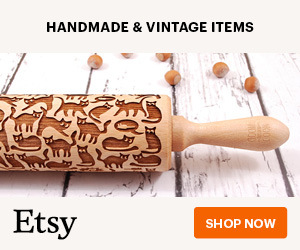 and comes with ten 8″ tall pins along with two wooden balls. Each ball does have finger holes but they’re a bit small. They won’t fit exactly the same as a traditional bowling ball so you may have to adjust your grip. But the balls measure a 2.5″ diameter so they’re an OK size, definitely not great though. The actual quality of the wood is superb. 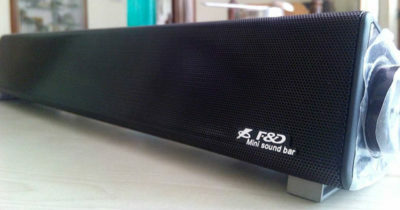 Very firm and very easy to play with. The balls can knock down the pins without too much pressure so you don’t need to whip the ball along the ground. And while this is technically an outdoor bowling set it can also work in the home. But the wooden balls can scuff up hardwood so you’ll need to play on carpeting if not outside. Considering the solid build I do think this wooden bowling set is top quality. However since it’s so small it may not be as fun for adults with larger hands. Kids should get a lot of use from it and the wood is firm enough to last years if not decades. 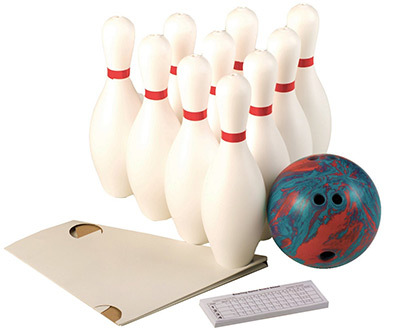 For a much larger bowling pin set check out the Cosom 15″ weighted bowling set. This comes with 10 large pins measuring well over a foot tall, and it comes with a 5 lbs bowling ball with a funky design. This set is marketed towards kids but it can work for people of all ages. The pins are weighted so they have a bit of cardboard in the bottom to give a realistic bowling experience. And the ball is heavy enough to knock them down and keep the game fun. 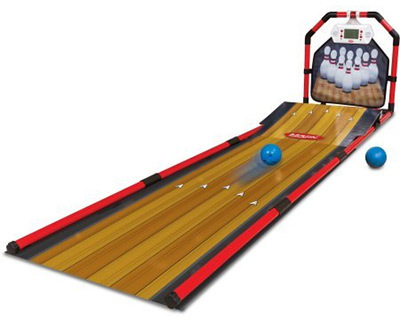 You can set this up inside but it’s best to create a lane or small section of the house for bowling. I think this works best on a harder surface but you don’t want to leave any marks! The easiest place to play is outside on pavement or in the backyard on grass. But you can bust this out for kid’s parties and even get the adults playing along too. The bowling ball is large enough to work for adults and it comes with extra finger holes to accommodate different grips. As a small bonus you’ll also get a notepad of scorecards which you can use to tally the game. These scorecards are a nice addition from Cosom and they make this bowling set feel truly complete. Table bowling games bring the adventure of a full bowling alley down to miniature size on your tabletop. And the Ideal Rack N’ Roll Bowling Game is a fun cheap alternative to a full-size bowling set at home. This does not use the same bowling technique as you’d expect with a full-size ball & pins. Instead it uses a spring-loaded ball launcher like you might find in an arcade game. 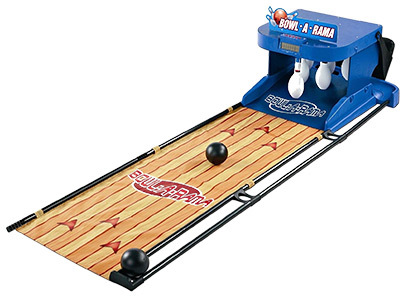 It comes with 10 small bowling pins, two small balls, and a pin rack you can use to reset the pins after each round. Plus it features a ball return so you never need to fish the balls out of the compartment. However the pin reset must be done manually and the pin rack helps you put it all in place(kinda like a pool triangle). In full this toy measures about 4.5 feet long which is incredible considering the size of everything else. The long design makes gameplay even more difficult because you really have to try to get the ball right on the pins. The quality is superb and this does not feel like some cheap toy. 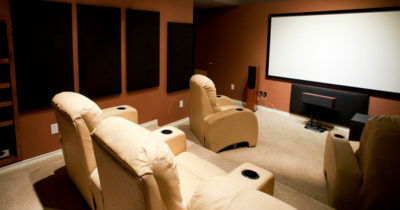 It should last for years and offer your kids hours of amusement. Plus no batteries required! 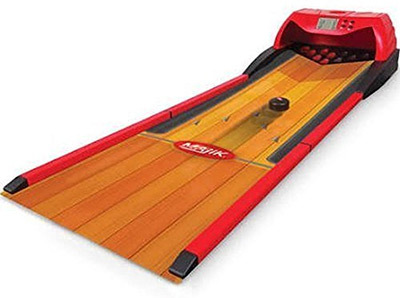 If the full-size bowling sets are not for you then this tabletop game by Ideal can offer a fun bowling experience without taking up much space. Kids don’t always want a bowling game that follows the rules. They just want something fun! And the Majik Electronic Bowlercade game is a ton of fun without using traditional bowling balls. Instead this arcade-style game uses small pucks sorta like hockey pucks. They slide up along the lane and land in the end with digital pins. This entire game is more like a simulation of bowling rather than real bowling. Some people might like this, others might hate it. Scoring is handled digitally in the screen above the bowling area. You slide the puck along the lane and it smashes into the digital pins. This data is then read into the toy digitally and scores are recorded this way. I know what you’re saying: why remove the pins? 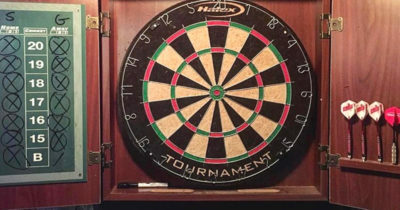 The game offers an alternative to pins that can be loud, easy to lose, and tough to setup. This arcade game is also fairly small(about 1.5 feet wide) so it’d be tough cramming 10 pins inside. With the digital pins you can play a game of 10-pin bowling, albeit through slight modifications. Much like other Majik products this one isn’t built up to the highest standards. The bowling lane is very flimsy and you’ll need to weigh it down. Other bowlercade games can get by with flimsy mats because they use rounded balls that roll on their own. The pucks need to slide and they’ll do best on a flat surface. In total the game measures 52″ long(about 4.5 feet) which is a decent size. This can fit on top of a table if you have enough space. And in fact this game may work better on a table if it has a flat surface. Just make sure you like the plastic puck style game before buying. If not there are many other bowlercade games that use real bowling balls and pins like the Stats game. But for a pin-free digital experience this game is super fun. It does take three D batteries for power so make sure you pick those up along with the game. Another cool tabletop toy is the Black Series 10-Pin Jumbo Tabletop Set. It comes with a full 5 foot long bowling lane with 10 bowling pins about 1 foot tall. It also comes with two balls so it can be played by 2-4 players. This bowling set includes a pack of scorecards so you can keep track of teams and who’s winning each round. No fancy lights, no batteries needed. Just good ol’ fashioned bowling at home. One thing I really like about this model is the sturdy design. It doesn’t use a cheap flimsy plastic material for the lane like so many other bowlercades. 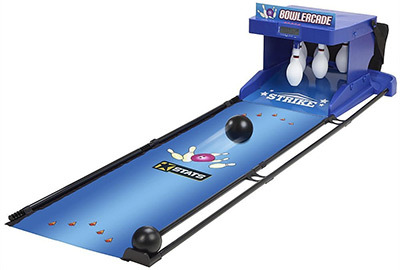 Instead this uses a thicker solid plastic lane, certainly not on par with real bowling alleys but definitely great for a home game. 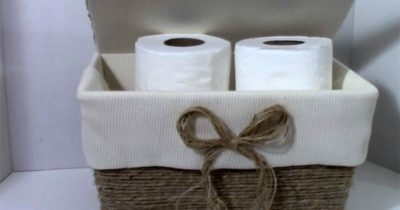 You can even break down the lane to bring this outside or pack it up in a closet when not in use. 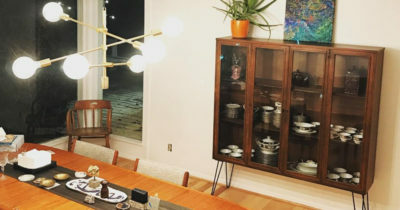 It’s super lightweight so it can be moved around the house to any table you want. And the balls are pretty lightweight too so they’re not difficult to use. The game is recommended for ages 12 and up, but I’d say younger kids could have fun with this game too. The pieces are large enough that your child shouldn’t be able to swallow them and they’re light enough that they shouldn’t do any damage to the house. For a tabletop bowling game this is one of the best. It’s made from durable materials and it’s actually fun to play. A much smaller yet familiar tabletop bowling set is the Dunlop DLP012 game. This is not made to be a full bowling game. In fact the player doesn’t even throw the ball. It uses a spring-loaded launcher with a small figurine of a bowler to send the ball up the 3′ long alley. You’ll notice right away this game is small and built to be like a little table toy. It does not replicate the full experience of bowling. However it can still be fun to play since the game is mostly automated. Scoring is entirely digital and powered by the game’s scoreboard. Adults may even find themselves loving this game and bringing it to work as a desk toy. It really is a fun little toy if you like the arcade gameplay. It won’t make you a better bowler in real life but it can help pass the time. Weighing about 3 lbs and only measuring about 4″ tall this toy is extremely small. The balls and bowling pins may be choking hazards for young children under 5. Please keep this in mind if you have a young child because there are plenty of small pieces that can go missing around the house. But older kids(10 and up) can spend hours on this game including some teenagers and even adults. The assembly is simple and it doesn’t take very long of playing this game to get hooked. This last bowling set is quite a doozy and it’s probably the best choice for all young children. The company Play Now made their own giant inflatable bowling set with bowling pins measuring 24″ tall. That’s huge! The ball itself also measures about 18″ diameter which is still pretty large. 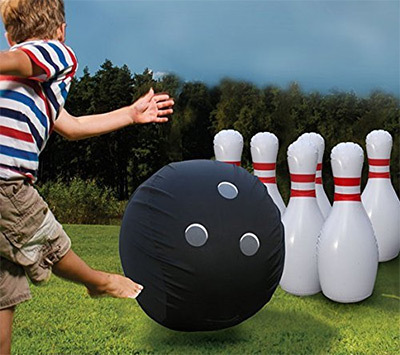 Young kids will have a blast at parties and the adults can even join in for some inflatable bowling fun. Every pin is weighted down with a small piece of cardboard keeping the pins fixed to the ground. This makes them easy to setup and tougher to knock down. 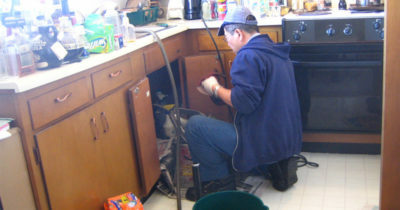 They can take a long time to fill with air so you might consider using an air inflator to save yourself the breath. These humongous bowling pins knock right over and they’re more about fun than setting up a bowling competition. But what’s more fun than inflated pins? How about a slip n slide where you can bowl yourself right into those pins! But one thing to be cautious about is the pin material. It certainly is thick but it’s also holding a 2-foot tall inflatable bowling pin together. One little hole and that pin is done. Try to set these up near a flat area with no rocks or jagged edges. If you can keep these inflated and safe from harm then you’re guaranteed to have a lot of fun. There’s a little something for everyone in this guide ranging from toddlers to grown men in business suits. If you’re looking for the best pick for home bowling then I recommend the Black Series Bowling Game. It’s made large enough for all ages and it’s built firm enough to stay together without risking cracks or any broken pieces. But if you want a free standing bowling set with realistic pins then check out this wooden lawn set made for both kids and adults. From inflatable bowling pins to smaller plastic pins and all the way to digital bowlercades for your home, there’s so much to pick from and so much fun out there. Take another look over this list and see if anything here could make for a fun afternoon replicating the joys of bowling at home.